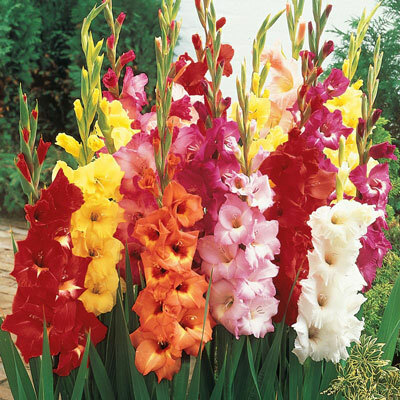 Field-Grade Glads | Henry Field's Seed & Nursery Co. Ideal for borders and bouquets! Brilliant blooms grace 3 to 4 ft. stems with handsome sword-like foliage. Best planted in full sun or partial shade. Our choice of colors. 8-10 cm bulbs. Zones 8-10. 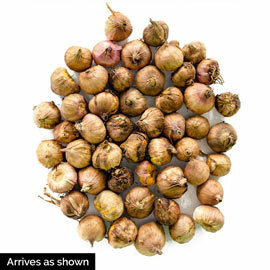 Zone 8 - 10 (bulbs must be lifted in the Fall in zones 3 - 7). For each offer ordered, get 50 bulbs. Color: Our choice of colors. Foliage: Sturdy green sword-shaped leaves. Flower Form: Flower spikes with trumpet-shaped florets borne in double rows. 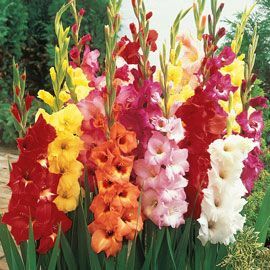 Soil Requirements: Glads can grow in a variety of soils, though sandy loam is preferred. Pruning: Dead-head. Allow foliage to die back. Bought these a few years ago at our old house and planted all of them in an area about 3'x4' by our front door that was slightly sheltered from the wind. They did absolutely great even without staking. Our guests always commented on how beautiful they were as they approached the front door. We also put some in a clear vase on the dining room table as a center piece and they were Spectacular! They look just like the photo here. Am buying some more now for our new house but will probably have to stake them since there is no shelter from the wind. If it freezes where you live you will have to dig them up or you'll never see them again.